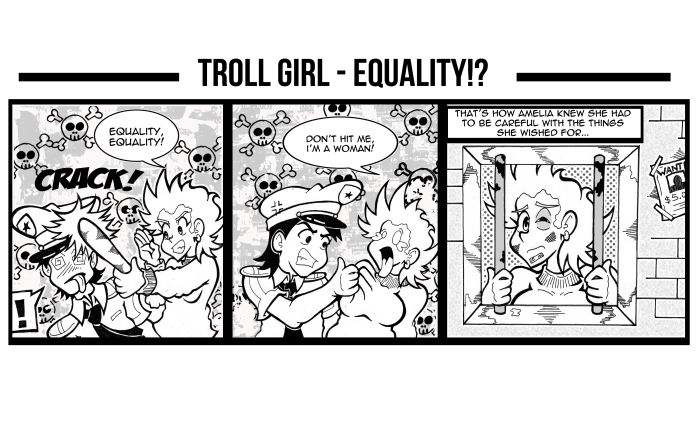 Troll Girl - Intermission - Equality!? Comic 212 - Intermission - Equality!? Sorry, folks. I had to give myself a break from the storyline in order to make a strip for my tiny, tiny newspaper thing. We'll be back with more plot on the next update, so stay tuned! What far too many people who scream for "equal rights" forget is that with rights come responsibilities! Equal rights often wind up little more than "revenge for past wrongs".